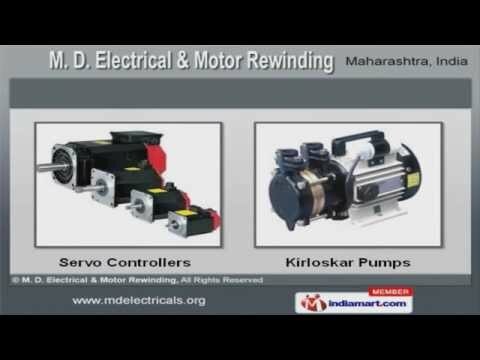 Welcome to M. D. Electrical & Motor RewindingManufacturer & Exporter of Industrial Motors, Pumps & TransformersWe are an ISO certified company, established in the year 1992, at Pune. Our Ethicaltrade practices help us to cater Indian Subcontinent. Chorus IT Limited, Klt Automotive & Tubular Products are some of our prestigiousclients and we are backed by transparent business dealings & Commodiouswarehouse. We offer a wide assortment of Control Panels & Programmable Logic Controllers. Our Servo Controllers & Kirloskar Pumps are best in the industry amongst others. Soft Starters & Industrial Transformers offered by us are widely acclaimed in themarket. Our Industrial Cables, Crompton Greaves Motors & Pumps are a class apart. We also provide Electrical Switchgears & Accessories that are in huge demand acrossthe global markets. Along with that we offer Oil Cooled Transformers, Electrical Drives & Inverters that aresome of our best selling products.